Unisex wide leg trousers with rouched elasticated waist. The ankle drawstrings allow them to be worn either in Aladdin style or to be left down as palazzo pants. Low crotch slim afghan style trousers with contrast details. Elasticated back waist. These super-comfy pants are Suitable for both men and women. Ideal for travelling or if you do not want to carry a bag, as the TWO BIG POCKETS allow you to keep all your essentials handy. The main color is mentioned first in the variant and is shown in the top part of the tassel. They come in TWO SIZES. Hip: cm 130 / inches 51. Hip: cm 136 / inches 53.5. Length of outer leg from waist to hem is the same for both sizes: cm 96 / inches 38. 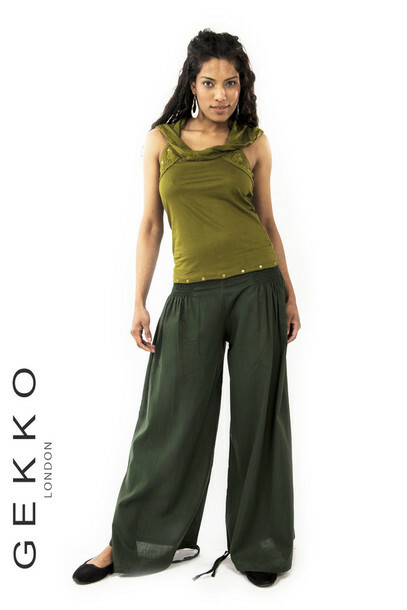 - See more at: http://www.gekkobohotique.com/profiled-unisex-afghani-trousers#sthash.9bLWZlTI.dpuf.